Polar Bear Horizon is a gorgeously illustrated title in Oceanhouse Media's Smithsonian Collection - a series based on popular non-fiction print titles about the natural world. The print version of this title was released in 2006 along with an audio CD. As an OM book this title sparkles, giving enormous value over its print counterpart, including narrated text that highlights as read. This book series fills a great need for digital book apps with non-fiction educational content. The books selected so far have been well vetted as print titles, making it easy as parents & educators to select these digital books with confidence. This title covers the lives of polar bears, their cubs, hunting and general facts about life in the Arctic. Each title in this series takes the original print images and pans over them in a nice, semi-animated style. There is also a nice array of sound effects, like footsteps in snow and bear cries, paired nicely with a great male voice-over. The sound effects also help the story come alive without overshadowing the narration. Overall, this is a solidly made book with nice enhancements. If you tap anywhere on the page, words appear that represent the different images (e.g. 'snow', 'seabird', 'cub'). If that word also happens to be part of that page's text, the word is highlighted within the text of the story, helping young readers make important connections between the written and spoken word. Paired with OceanhouseMedia's omBook's template, non-fiction titles get a clear educational boost when print goes digital. As a way to foster a child's love of a favorite animal, this app gets high marks. It is well developed and based on sound scientific information. There are even a few pages at the end with extra educational content. These books are also beautifully presented with light enhancements that make delightful print titles come alive (while still meeting the educational needs they served so well in print). The story begins with a cozy den of polar bears in Alaska, waiting for their mom to tell them it's time to head out for the first time in the spring. As the cubs explore their new snowy world, they see lots of other artic animals. They play, trek after their mother and get used to the ice. The mother bear teaches her cubs to hunt as the Arctic summer stretches to shorter and coler days. One night, they even see the beautiful 'nothrern lights' glowing in the dark sky. When the winter snows begin, the polar bear and her cubs curl up together. Until they are 2.5 years old they will stay with their mother, but soon after they'll be on their own. 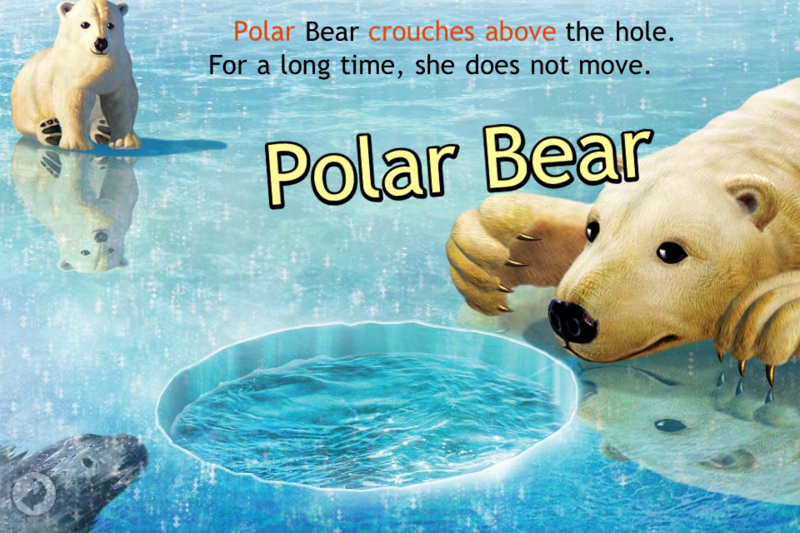 Several pages of facts about polar bears follow the story.